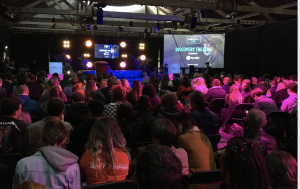 MUSIC students from South Essex College learnt about the industry they hope to work in during their recent trip to BBC Music Introducing LIVE. The event, held at Tobacco Dock in London, gave students the chance to attend masterclasses and lectures hosted by industry talent at the BBC. Students from the College’s Music Performance and Technology courses were inspired by workshops on a variety of topics including song writing, live events such as tours and festivals, how artists make music and build a fanbase, understanding A&R and record labels plus business, marketing and finance. During the trip, students were treated to several performances from up and coming artists as well as more established musicians. They also had the chance to submit their music to a panel of experts.